Banks that have considered operational details and client behavioral needs will realize a quicker return on investment. Boston, June 20, 2018 – Real-time payments is one of the hottest topics in payments today, and with the launch of The Clearing House’s RTP system, banks are considering their strategies around business-to-business real-time payments. 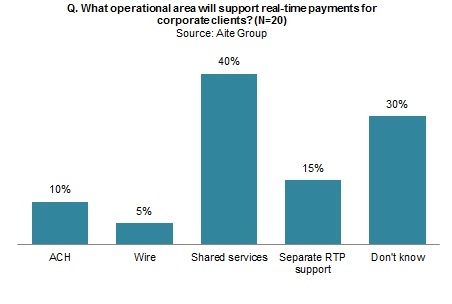 But what operational considerations are banks faced with when introducing a new real-time payment workstream? Based primarily on the results of a January through March 2018 survey of 20 of the top 60 U.S. banks, this report overviews banks’ operational considerations and includes predictive information on how corporate bank customers will accommodate after-hours payments, expect payment alerts, and approve real-time payments. This 25-page Impact Note contains 14 figures and two tables. Clients of Aite Group’s Wholesale Banking & Payments service can download this report, the corresponding charts, and the Executive Impact Deck. This report mentions BNY Mellon, Citi, JPMorgan Chase, PNC Financial, Ripple, SunTrust Bank, The Clearing House, US Bank, Venmo, Volante, and Zelle.